ummmmmmmm......don't you just love the smell of clothes dried outside? Happy December to you! I love that photo. Outstanding! Wow, I love it. You are very color-coordinated! Reminds me of staying with my grandmother, she had a washer but no dryer. I remember I hated how my jeans felt when they were line dried, but towels are just the best. great colors! I love laundry photos. surreal and dreamy. i love that picture even though i'm not a fan of line drying. my clothes always come out kinda stiff. My husband's grandmother lives in upstate NY. When we stayed more than a few days we washed our clothes there. She showed me now to hang clothes on a clothes line that was attached to a telephone pole a long way from the house that was on a pulley. It was the neatest thing I had ever seen. Sheets and pillowcases, were so crisp from being dried outside. Great photo and wonderful memory! in England everyone line dries all the time. what does that tell you? ha! they look like color-clothing bandits that have given up on a life on the run :) PS I love turtlenecks, too! Ha! This is so my childhood! Except that my dad would hang the clothes out to dry in the (freezing cold) wintertime and we would have frozen pants to thaw when we brought them in! That, and he never quite figured out how not to leave clothespin stretch marks on our shoulders - we'd have little peaks that would stay even after wearing them. Thanks for the blast from the past! How beautiful those bright colors are against the backdrop! 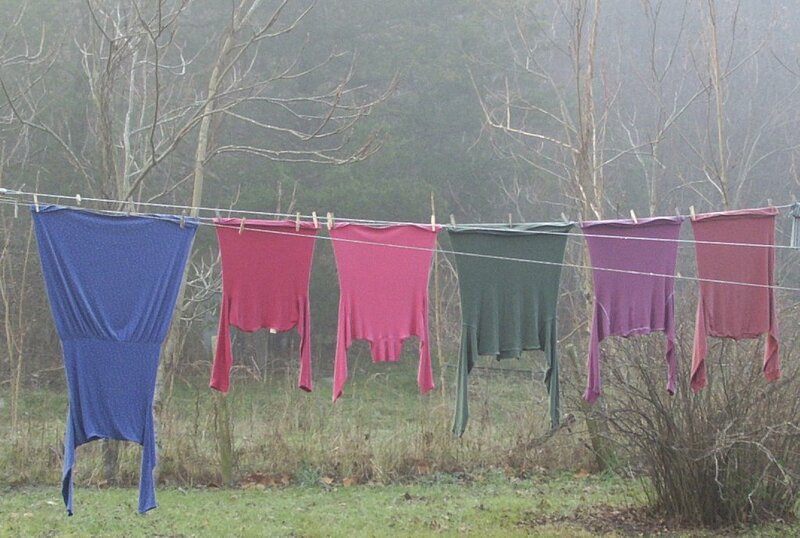 There are two schools of thought about stiff clothes - first is put wet clothes in dryer for a few minutes and then hang, the other is to use softener, hang, dry, and throw in dryer for a few minutes with a damp washcloth. I suppose you could iron, if one knew how. This one doesn't. That makes me smile. Very nice colors, I can see them on you. My theory on fixing the stiff clothes is to shake them out once or twice as they hang. I love this photo - it reminds me of how much I love putting on stiff jeans and crackly shirts that have hung out to dry. we always hang ours on the clothesline, and if its raining hang them on the line strung up in the garage..
the last resort is the dryer if its too cold outside for the air to dry them properly. I love clothe drying outside, but with enourmous amounts of clothes in need of a wash every day a tumbledryer is the only solution except in the summer. I don't understand how you can make even clothes look soo pretty! Someone had an online website devoted to the hanging of laundry (I can't find it now); back when I was doing my old website, I was going to do something similar and asked for laundry photos from readers - they were awesome! My favorite thing about this photo? It was totally unplanned. As Joe put it, "You couldn't have arranged that any better if you'd tried." And I didn't. I was just walking from the garden to the house (with my camera), looked over at the laundry hanging on the line, and saw a photo. I took this one picture and that was it. I'm thrilled everyone has enjoyed it so much. Thank you all for taking the time to write.